A very basic pattern that is simple and quick. You can embellish with embroidery, beads, applique or add stripes while knitting. I added an embroidered heart to my set using two bullion stitches with a lazy daisy stitch around each bullion. I used 2 strands of DMC embroidery cotton. It is easiest to embellish before stitching the side seam. These mitts are knit flat from the top of ribbed cuff to the bottom garter stitched edge which goes around the four fingers, thumb hole is created by binding off stitches mid row then casting them on again on the next row with the backwards loop cast on to create a buttonhole for the thumb. 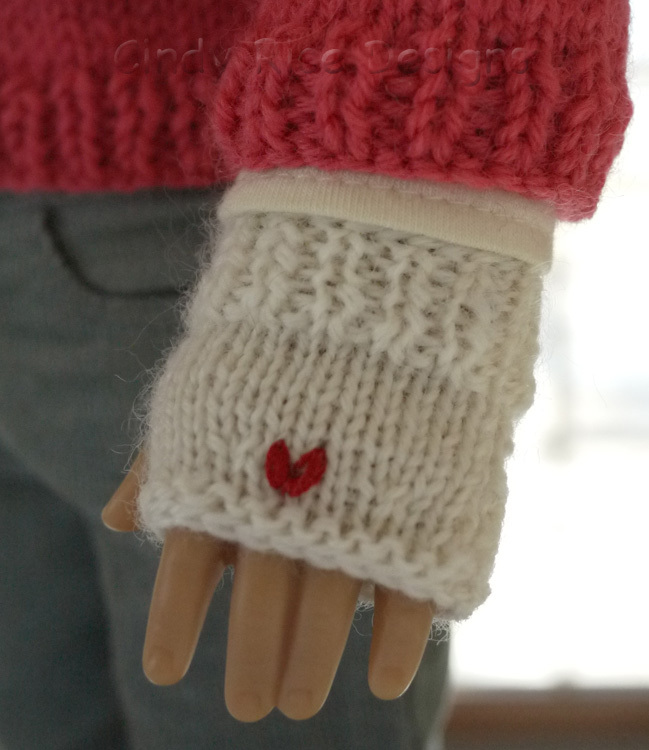 Very Pink knits video is here if you’d like a visual tutorial on the backwards loop cast on. The two edges are grafted together to form a tube which forms the mitt. The two mitts are not identical in thumb hole placement. 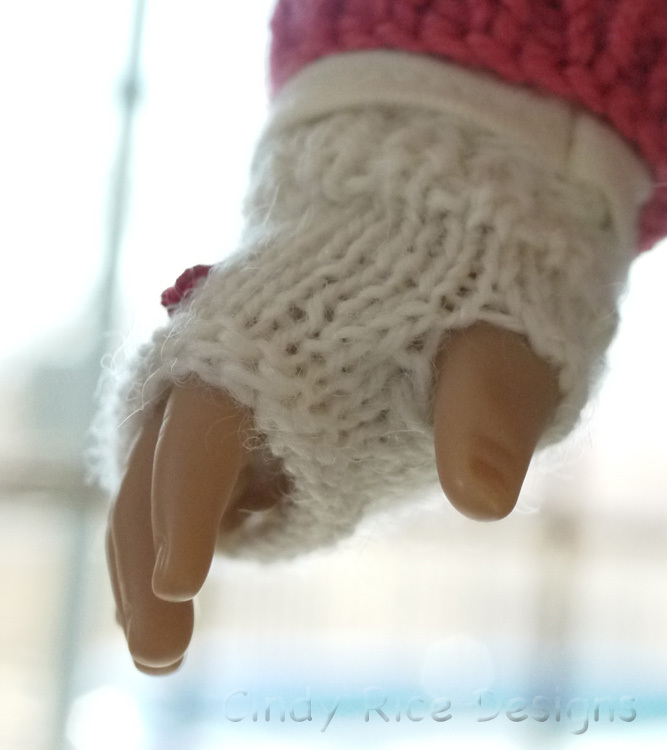 I wanted the side seam to go very slightly to the underside of the hand and not look like it was right at the pinkie so thumb hole stitches are reversed on these rows. Instructions are included for each. For first mitt follow separated instructions for mitt #1 and mitt #2 instructions for the second mitt. Instructions that aren’t specified for one or the other are the same for both. Using long tail cast on, cast on 32 stitches. Begin with a wrong side row (all odd rows). 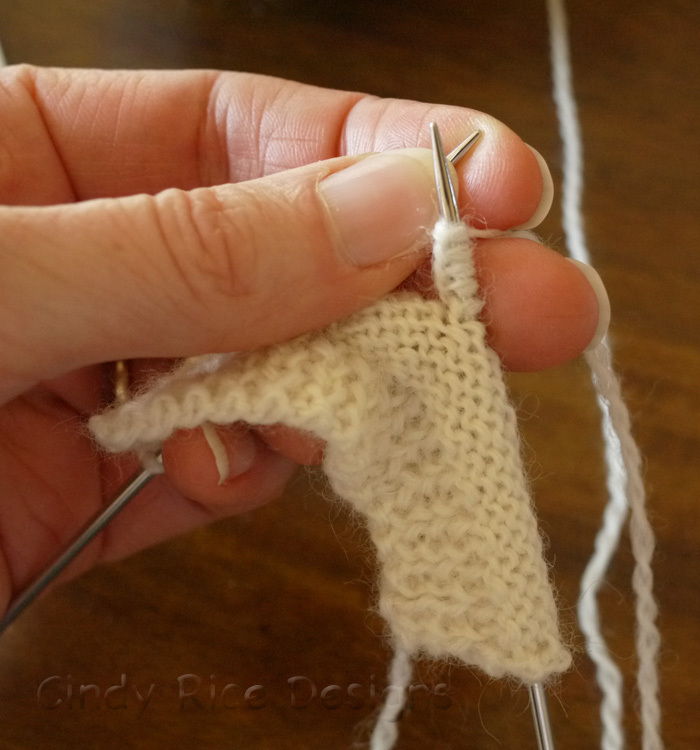 Rows 8-11 work in stockinette stitch, beginning with a right side knit row. mitt #1: K15, bind off 1 stitch, K and bind off 3 more stitches for a total of 4 bound off stitches, K 14=28 st.
mitt #2: K17, bind off 1 stitch, K and bind off 3 more stitches for a total of 4 bound off stitches, K 12=28 st. The above pic shows mitt #1 after row 12 is completed. mitt #1: P15, cast on 4 stitches onto right needle (don’t work them), P13=32 st.
mitt #2: P13, cast on 4 stitches onto right needle (don’t work them), P15=32 st. Above pic shows row 13 in progress after the 4 stitches were cast on. Above pic show what your work should look like after completing row 13 for mitt #1.
mitt #1: K13, (you are now at the cast on stitches)K into the back loops of the 4 cast on stitches, K15=32st. 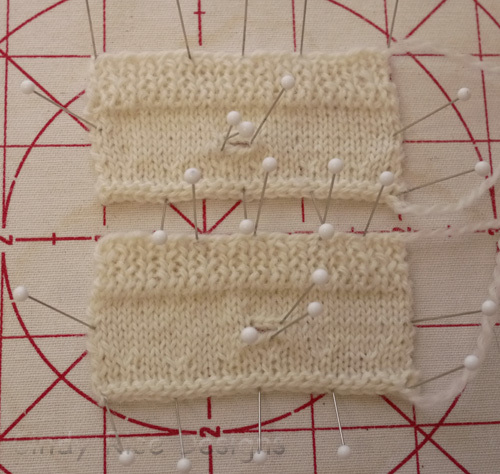 mitt #2: K15, (you are now at the cast on stitches)K into the back loops of the 4 cast on stitches, K13=32st. Row 16 decrease 6 times like this: *K3, K2tog*repeat between * 3x, K2, *K2tog, K3*rep. betw. * 3x =26st. Dampen and block work. Graft the sides together using mattress stitch. 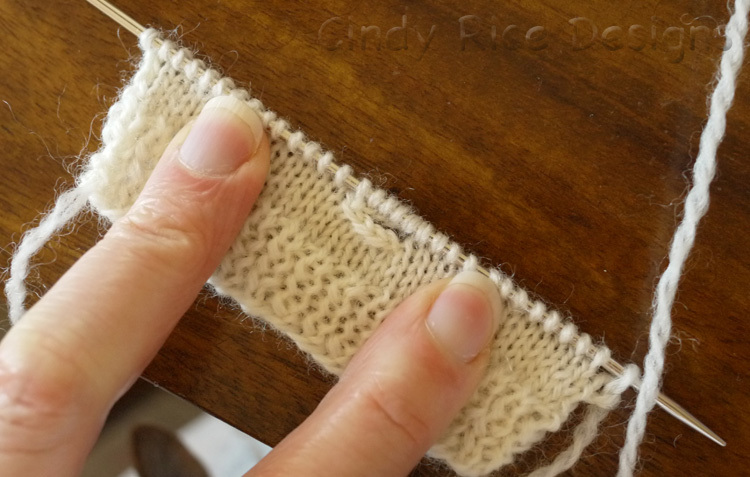 I like this 4 minute mattress stitch tutorial from Very Pink Knits on You Tube. It is found here. See the pics on p. 10 of my Free American Girl Cardigan Pattern for the technique I use to get the corners to meet up perfectly before grafting the straight edges together. The download link is on the “Free Patterns” home page. The wider half of the mitt goes on the top part of the hand. The sweater Ivy is wearing is made from my free cardigan pattern which is available for download under the same tab you found this pattern. there is no download that I can see! It’s not a download. The entire pattern is written in the blog. 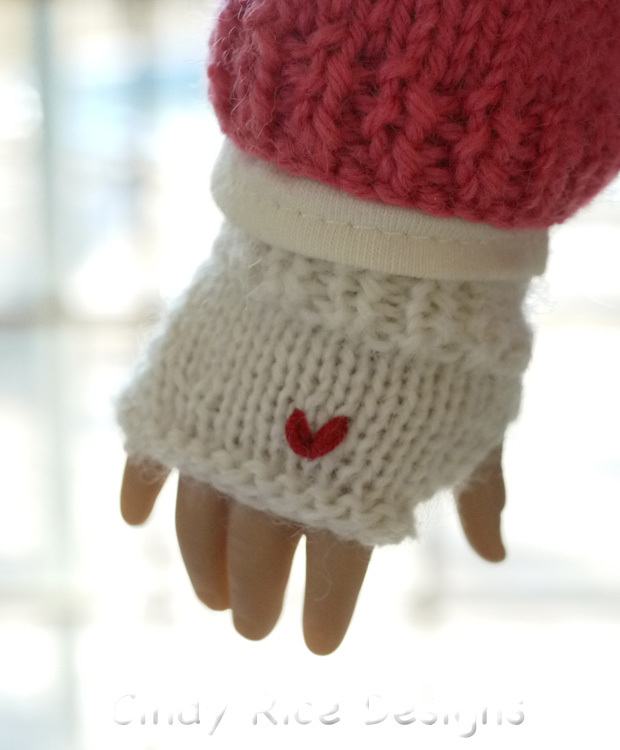 Go to the Free Pattern tab and click on AG Mitts. i am trying to reach you about making something for me … how do i get in touch with you about something like this. Thanks for your generosity in sharing these free patterns.